Utopia Flexible Pvc Braided Water Risers- Large Diameter – F.I.P. X F.I.P. 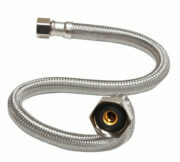 Utopia Flexible Stainless Steel Braided Water Risers – Compression X F.I.P.